I have become a cookie monster. I am not entirely sure what has caused it. I guess it's got something to do with winter where something more substantial than a piece of fruit is needed as a snack. I keep telling myself that I bake them for my kids. A little nut-free treat for the lunch box, now that even my little one is going to school. But I am afraid that's only half the truth. Perhaps cookie baking (and eating) has become my substitute for marathon training? After spending three months on the actual training, then run the race and as soon as it's over get ready to smash the current PB of my half marathon, I am sitting here and suddenly have a lot of time on my hands. Time to eat, much, snack... In a way, I still feel my body needs to recover from the races of the past month. That shows by inexplicable hunger attacks that seem to fall from the sky onto me. I give in, naturally. But try and keep it as clean, healthy and homemade as possible. Today's cookies are were in fact developed to be vegan and nut-free. It didn't take many trials until successful cookies came out of the oven. I have made several batches of those in the past couple of weeks that I shared almost equally between me and my daughter. 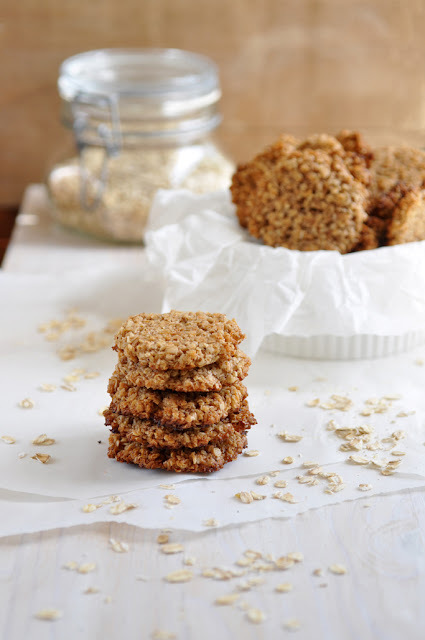 This oatmeal cookie has so many good ingredients that I can oversee the fact that it's not grain free. Enjoy!